All transactions are safe and secure with a reliable history in online purchasing behind each of our associates. 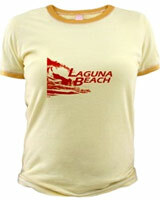 Buy the Laguna Beach Wave Logo t-shirt to own Laguna Beach clothing and merchandise. Soak in the summer sun in this popular wave logo MTV Laguna Beach tee. The red design includes a silhouette of a crashing wave to the left of the TV show's title. This Laguna Beach clothing item is perfect for anyone who can relate to the show's main characters, including Lauren Conrad (LC). Lauren watches as her best guy "friend," Stephen Colletti, tries to win back his ex-girlfriend, Kristin Cavallari. Stephen turns to LC for support while Kristin is off hooking up with other guys, including Talan Torriero. In addition to the Laguna Beach Wave Logo tee above, browse the Laguna Beach Clothing Gallery for more apparel like men's and women's clothes, kids shirts or hoodies.